Jen integrates her experience and training as a bodyworker and yoga teacher to offer a self-treatment practice addressing common issues faced by modern bodies. 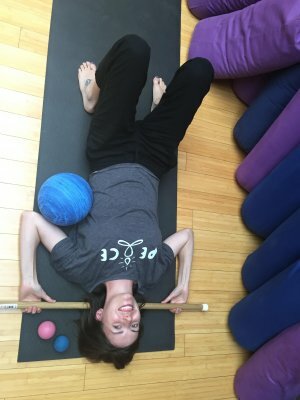 Use therapy balls, blocks, blankets, dowels, and more to apply DIY massage techniques throughout the body. Work out the kinks and nourish yourself with a combination of rest and varied movement. Let go of stress and move toward greater embodiment with deep relaxation. Yoga teachers can receive credit towards Yoga Alliance CEU requirements through this practical and experiential workshop! Limited to 12 participants, pre-registration strongly recommended.